I woke up shaking and stressed...my mind foggy and confused as I tried to figure out the difference between dream and reality. Thoughts racing and heart pounding, things started to become more and more clear and I realized it was a nightmare. Only a hideous, horrifying nightmare that left me tense and on edge...a complete ball of nerves. Let me paint you a very scary picture. We were in Disneyland. The happiest place on Earth. My mom was there with us. She had decided to bring some toys along to occupy the kids during the down times. For some unheard of reason, she decided to bring the blocks. MY blocks. The fabulous, colorful ones Miss B received for her 1st Birthday...but that I soon claimed for myself because I love them and have cared for them for 10+ years through 7 or 8 moves, 3 states, storage units, closets, and crazy toddlers who love to throw them and hide them and lick them. I have spent many sleepless nights wondering where the missing block or two was. I have always found them. ALWAYS. Sometimes they are gone for a few days or even weeks, but they turn up...and I lovingly tuck them into their little wagon alongside the other block friends, happy as can be. I'm even so nice as to let kids play with them. But I keep track of them...diligently. It is my little OCD confession. I cannot help it. So in my dream, when the blocks were being systematically lost all over Disneyland, naturally I almost lost my mind. I woke up during a frantic rush trying to find them all. And it took me a few good hours to relax. 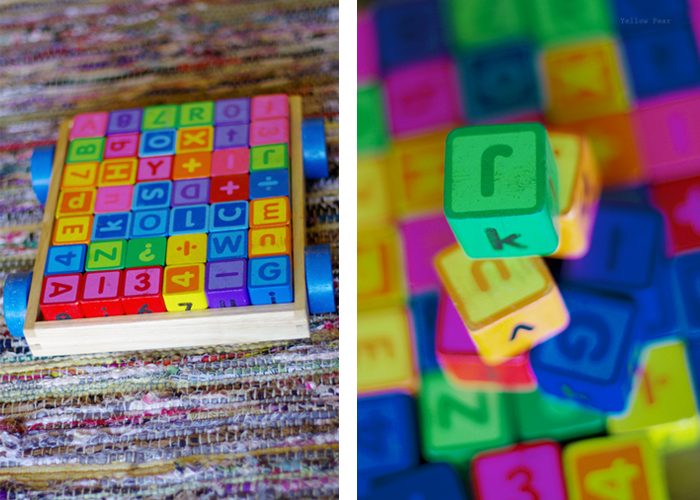 I found myself wondering why the thought of losing a set of fabulous, colorful wooden blocks could shake me so bad. I don't have an answer really. Just don't mess with my blocks. Ever. And I won't be bringing them to Disneyland anytime soon. Lou? Is that really you? And OCD trait?? Now you know what it feels like when people paw through my pantry and fridge! HAH! Now you can feel free to huck a few of those pretties at the Princesses for their unfair portrayal of weak women in subjective careers, bean one off of the "Its a Small World" animatrons, let one live in the 70's day glo Alice in Wonderland freak ride, and plant one on top of the Matterhorn after one of the gazillions of times that the ride is canceled as you are inches away from boarding after a 2 hour wait. Take THAT happiest place on $8 for a soup bowl overcharging for cheap felt hats money sucker! I'm gonna go to Universal Studios and get a real wizards wand at Olivanders instead!!! Wait. Um. That was just supposed to be a short, "here you can get those elsewhere" post. Sweet dreams.